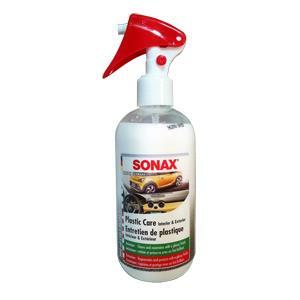 SONAX Plastic Care – the quick and universal solution for your complete car! For interior: cleans and maintains all plastic components (e.g. cockpit, door trim panels, center console, seat linings etc.). Its simple application quickly ensures gleaming, streak free surfaces and intensively freshens up colors. For exterior: rejuvenates, protects and preserves all unpainted plastic components (e.g. bumpers, styling strips, door handles etc. ), it conceals fine scratches and dull spots. Perfect for the engine bay! Its the fast and easy solution to restore the shine and protect the plastic parts after cleaning. Simply spray and let dry – no need to wipe.